This post may or may not contain spoilers. Most of this is speculation, but my speculation is usually creepily accurate. No, seriously, it’s scary. This fangirl has just heard some disturbing news from her contacts at Court Records. First, just look at this (from the 3/12 issue of Famitsu). I mean, what is this?! When did Apollo become a severely injured pirate? I’m not sure how I feel about this. But it’s official. Apollo will be in the game. He’s even got a profile on the game’s website. There are some pretty interesting theories circulating about this particular piece of artwork. 1. Apollo was the defense attorney when the bomb blew up the courtroom. This seems valid to me, as the destroyed courtroom greatly resembles the one from AJ. It also explains why Phoenix is now taking cases instead of Apollo. 2. Apollo’s “perception” will be affected from this. Again, logical, as he’s kind of MISSING AN EYE. 3. Finally, Apollo is the prosecutor for AA5. This is crazy. I sincerely hope this is not true. People say that the silhouette at the end of the trailer resembles Apollo in his new jacket. Also, his defense attorney badge is gone/not visible, which is odd. If Apollo is the prosecutor, I may have to boycott the game. Which is saying something for me, the fangirl. I support Evil Pirate Apollo. We never found out who his father was, after all. Maybe it’s Captain Jack Sparrow. If Apollo as the villain, there will be no need for an introduction; players will already know who he is, and they will sympathize with him instantly. I don’t think he’ll go full-blown villain, but he has definitely earned the right to be angry with Drunken Hobo Phoenix. Fanfiction in the making… Don’t tempt me. I do agree, I didn’t really like Godot’s introduction either. For the first few minutes, it was intriguing to look for hints as to WHY he hated Phoenix, but there were none. I agree with this too. I just… can’t wrap my head around it, I guess. I support Pirate Apollo fanfiction, as long as Pirate Apollo has a parrot named Polly. Phoenix: Apollo? You’re the new prosecutor? Apollo: That I be, matey. And ye have shivered me timbers for the last time! Phoenix: Oh, come on, Apollo, I said I was sorry! I even gave you a free pudding cup as an apology! Apollo: I don’t want your pudding cups! I want you to suffer at my hands! Prepare to lose! I’m going with that he probably got injured, and that coat he probably bought with money he made from past cases, because it looks badass. I don’t want pirate Apollo. DO NOT WANT. Hm. Since the theme of GS5 is “dark days for law”, it would (kind of) make sense for Apollo to be the new prosecutor. This improves my opinion of him greatly. However, if you notice the artwork, the defense attorneys wear their badges high on their left lapel. His new, INCREDIBLY BADASS, coat could, in theory, be covering it, but if it is, it is probably intentional. It would put a nice spin on things if Apollo is the prosecutor. 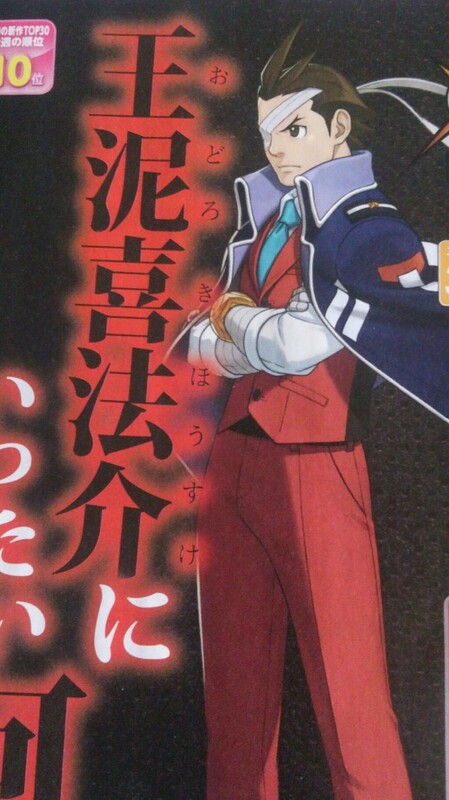 I’d like to see how his turnabout style translates to prosecution, and conversely how Phoenix would work against it. Seeing as Capcom has not put a profile of the new prosecutor, I think there is credible evidence for Apollo to be the new prosecutor. I was implying that it was being covered by the coat if it is indeed there. Sorry, that wasn’t clear. And I agree, the coat is badass. Looking at the picture again, I have to ask, what/who is he looking at to give him that pissed look on his face? Silly Rizzi, that’s his dramatic face. Come on Rizzi, wouldn’t YOU be pissed if you knew someone wanted you dead badly enough to BLOW YOU UP?